Newsgur USA: Will Mike Pence and Kim Jong Un’s sister skate together at Olympic Games? Now is trending news what could be breaking news: the possible meeting between Mike Pence, U.S. Vice President, and Korean officials, including leader Kim Jong Un’s sister, during Winter Olympics Games in South Korea. But the North Koreans canceled at the last minute. As we can see during these WinterGames both Koreas have shaken their hands on diplomacy. They created a team of Women Ice Hockey with members from both Koreas, and they paraded under the same flag during the opening ceremony of the Winter Olympic Games. But it seems that US diplomacy is as erratic as his president or not too much. Who knows? North Koreans believed the real intention of US speeches and policy would soften the message against their country, but a few hours before the meeting Pence condemned North Korean human rights’ abuses and announced plans for new economic sanctions. Which are the real intentions? No doubt the United States of America are not interested in softening the policy against North Korea. Certainly, the military industry and the head chief of the military power are very happy with the military budget’s enlargement. Should they be nice with North Korea? It is simple; they can assure, with the increase of the budget, new nuclear weapons or other kind of guns. However, that is not the international message of US government. According to Pence, Donald Trump made the decision to dialogue but only under American terms. It is possible that North Koreans were angry because one of the demands was the carry out the country’sdenuclearization. On this regard, Pence added the United States weren’t going to change any of their positions or negotiate. 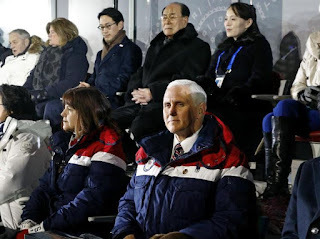 Last week, during the games, Pence seated just feet away from Kim Yo-jong, but they did not converse. He considered inappropriate for US to hold a social interaction with her in that occasion. It´s contradictory that the mentioned meeting would have been the first one scheduled between senior officials from the Trump administration and Pyongyang, which would have been a historical day because that would have reduced the threat against the United States’ territory. North Korea’s development of nuclear weapons makes the United States vulnerable. The Washington Post said Pence was going to meet with North Korean leader Kim Jong Un’s younger sister, Kim Yo Jong, and the nominal head of state, Kim Yong Nam, but the North Koreans called the encounter off, maybe motivated for Pence critics about Pyongyang’s nuclear ambitions, announcing the “toughest and most aggressive” sanctions against Pyongyang. At the same time, the United States tied the links between Japan and South Korea to establish an alliance in case a Nuclear War happens. Despite what showed in the nice pictures of both countries’ delegations (North and South Korea) at the Olympics, the hostility of Washington pushing South Korea against North never stops. South Korea’s Foreign Minister, Kang Kyung-hwa,said the conversations to enhance inter-Korean relations had to go in lines with theremoval of North Korea’s nuclear arms. There is no doubt from where the message comes. Seoul has bonded with Washington, the one that decides which policy to follow referring Pyongyang. As a matter of fact, it is not casual that Kang said whilepress-interviewed that only when denuclearization happens inter-Korean relations will move forward. In addition, he added Washington’s role is “very important” when making North Korea to abandon its nuclear ambitions. The tension in the Korean Peninsula rose to its higher point since North Korea launched several nuclear weapons as part of their nuclear program. They increased the weapons tests since late November, when its largest intercontinental ballistic missile was shot off. The meeting between Pence and North Korea’s delegation could have been a sign that Pyongyang and Washington would abandon the hostilities between them after months of tension and exchanges of insults between US President Donald Trump and Kim. Threatens comes from both side. On August 8, 2017, American president Donald Trump warned that North Korean nuclear threats would "be met with fire, fury and a frankly power never seen before. But North Korea responded launching a missile over Japan. On August 10, 2017, North Korean Lt. Gen.Kim Rak-gyom replied to Trump's "fire and fury” that “a reasonable dialogue” wasn't possible with Trump as president of the US and emperor of the world.